Trump University: How Donald Trump’s for-profit seminar company allegedly ripped off poor souls who wanted to get rich quick. Lesson No. 1: perfecting the rich-guy squint. Donald Trump speaks as university President Michael Sexton, left, looks on during a news conference announcing the establishment of Trump University on May 23, 2005, in New York City. For Donald Trump, it’s never been enough to simply run a real estate empire. He emblazons his family name on just about everything he builds. He’s been a tabloid fixture in New York for the better part of four decades. He’s done time on reality television, bellowing out “You’re fired” on The Apprentice. He’s even been involved in education. To say that Trump University did not deliver for many of its students is to indulge in understatement. New York state sued Trump and Trump University in 2013, alleging it had engaged in “persistent fraudulent, illegal and deceptive conduct.” There’s an ongoing class-action lawsuit in California, claiming the school was a “fraudulent scheme.” Trump University responded to yet another lawsuit by countersuing the lead claimant, alleging defamation. As it turns out Trump University wasn’t a university at all—as New York state authorities pointed out, universities need charters. Instead, Trump University was something known as a wealth seminar, an insidious byproduct of our age of inequality and do-it-yourself financial planning. People were invited to a free—or “FREE,” as the mailers advertising Trump University declared—seminar, held in a local hotel like the Hilton Garden Inn in Greenbelt, Maryland, the Renaissance Glendale Hotel and Spa in suburban Phoenix, or the Doubletree in Berkeley, California. There, “hand-picked” instructors would begin to school you in the intricacies of investing in real estate so that it could seem like a reasonable thing for someone to do. And what happened next? What’s known in the industry as the upsell, a pressure-heavy attempt to get consumers to buy in, and I mean that literally. Those attending Trump University’s free seminar were repeatedly told they should sign up for a three-day seminar called “The Apprenticeship Program,” costing $1,495, if they really wanted to get ahead. Yes, another class! And another. And special mentoring. All of it could be yours—for a price. That’s the upsell. As laid out in a lawsuit filed by Tarla Makaeff, the California woman Trump University countersued, there was the Gold Elite package, costing $48,490, but available to attendees at the “one day only” special sale price of $34,995. If they couldn’t afford that, Trump University also offered Silver Elite and Bronze Elite plans at a limited-time discount. And how should a student pay for that? Well, you remember that credit card, right? On the plus side, there were no student loans offered. Trump University was not alone in allegedly embracing this sort of business model. The modern era of wealth seminars began in the early 1980s, basically running parallel with the worsening of income inequality, the explosion in easy credit, and federal regulatory changes that allowed television stations to more easily sell airtime to would-be gurus. One pioneer was Robert G. Allen, who pushed books like Nothing Down: How to Buy Real Estate With Little or Nothing Down. The aughts brought us Robert Kiyosaki’s Rich Dad, Poor Dad seminar empire, which was eerily similar to Trump University. Eager acolytes would be invited to a “free” seminar located at a nearby hotel, where they would be regaled with tales of Kiyosaki’s wealth and urged to sign up for a three-day seminar, usually related to real estate investing. (Rich Dad Education, either less greedy or more savvy than Trump, charged a mere $300 for its three-day class). This was so effective that the organization came to a $1 million settlement with the state of Florida in 2008 after, to quote from the press release announcing the deal, “consumers complained that the introductory programs and seminars, touted as training that would change careers and lifestyles and give persons financial freedom and independence, covered only very rudimentary information and were used mainly to entice consumers to purchase ‘more advanced’ and significantly more expensive training programs.” When the Canadian Broadcasting Corp. show Marketplace signed up and sent a reporter off to the Rich Dad three-day seminar, the class was presented with a prepared script so attendees could call their credit card companies and have their limits raised to $100,000, supposedly for the first purchase, but, as a number of attendees suspected, as a way to pay for the next level of classes. It’s also possible that conservative voters are inured to this sort of stuff. Journalist Rick Perlstein has pointed out that any number of Republican politicians and talking heads seem to view their supporters as cash cows, selling their email lists to outfits marketing everything from miracle arthritis cures to surefire stock tips. The “long con,” Perlstein called it in the Baffler. And maybe we are all inured to this. After all, it’s not like the real estate crash put the wealth seminar business out of business. 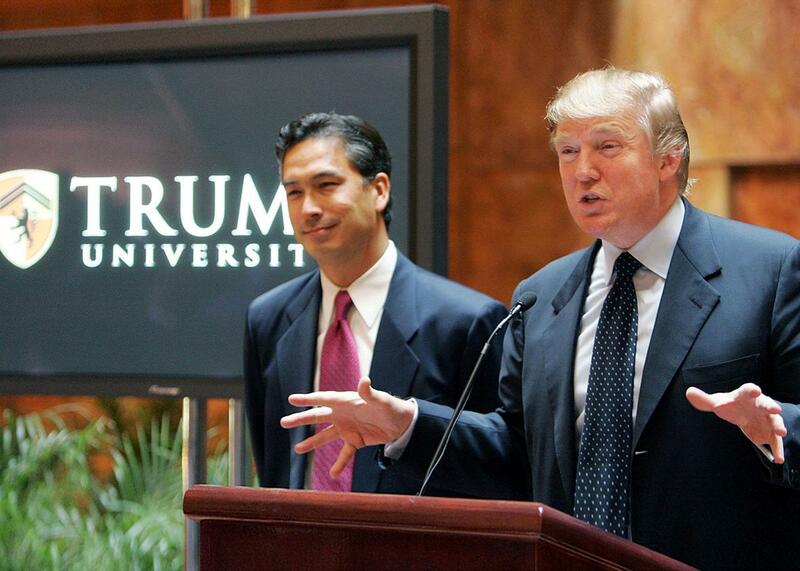 True, Trump University, after changing its name to the Trump Entrepreneur Initiative, all but shut down in 2011. But no worries. You can still learn how to make a fortune betting on foreclosures, flips, and rental income schemes. If you attend the class, you’ll be urged to sign up for a three-day extended session, which costs, according to published reports, $1,496.